Most boat kit builders build their boats at home, and only have 240V mains power. Because of this, the selection of welders is limited to 240 Volt machines. As some builders may have 3 phase power we have listed both types of machines. There are three types of 240 volt machines used for welding aluminium and steel. These are (1), The standard Transformer machine, (2) The newer style of Inverter machine and (3) The top of the range Pulse Mig machine. All of these machines are available for operation on 240 Volts. At our aluminium welding and boatbuilding courses, we allow students to operate all types of welders. We have 7 of these Pulse Mig machines setup in our training area. For all machines that are setup to run aluminium , there are 4 things that are required to be changed. These include, aluminium "U" groove drive rollers, a teflon low friction liner fitted to the Mig gun, Argon gas, and oversized tips (usually designated 1.2A). We recommend to use the most expensive welding wire that you can afford. Our preference is Safra 5356, 1.2mm diameter. Our machines of preference that we recommend for the home builder are: (1) Cebora 2060/M and (2) T&R Multi 250K Pulse Mig Welder. Both of these machines are listed below. The preferred three phase welding machines are: (1) Cebora 2740 and (2) Fronius TransPulse 2700. Please call or email us if you require information or a quote on either of these machines. Specifications for the welder are to numberous to mention here. By clicking on the picture (left) or selecting the link below, you will be directed to a PDF file with machine specifications and Information on Pulse and Double Pulse welding. Machine Specifications of the 2060 Cebora are listed below. File is in Adobe Acrobat format. Cebora-301.PDF - (357 K - 2 pages with full specifications and information on Pulse Welding). 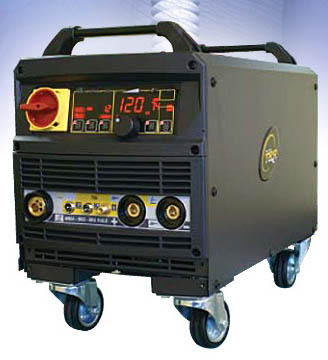 The T&R is a multi function machine and can operate as a Pulse Mig welder, DC Tig welder and stick welder. By clicking on the picture (left) or selecting the link below, you will be directed to a PDF file with specifications and Information on Pulse and Double Pulse welding. Machine Specifications of the 250 Multi are listed below. File is in Adobe Acrobat format. Multi 250K Brochure.PDF - (544 K - 3 pages with full specifications and information on Pulse Welding).